If we're going to try to piece together the climate Star Trek was entering in the mid-1960s and the way it might have first been received, it would be beneficial to spend some time talking about its closest contemporary TV cousin. Star Trek was but one of many science fiction shows on the air during this period, but the one it's most frequently compared with is Lost in Space. There are a number of very good reasons for this: One, the two shows ran nearly concurrently, with their premiers and finales less than a year apart and two, both were voyaging starship shows loosely based around going to a new place every week and stumbling into adventure. Also, from a mid-1960s US perspective, Lost in Space would have been seen as “the other big space show” as while there were quite a few shows built in the adventure sci-fi model a great deal of them were German or British productions and would remain unknown to US audiences for decades. The flipside of this is that for a long time Star Trek fans had a history of speaking derisively about Lost in Space, typically holding it up as the chief representative of an older, sillier, and campier method of doing TV sci-fi that Star Trek's emphasis on Hard Science thankfully swept away. And superficially at least the two shows do in fact seem strikingly different: While the Enterprise crew is often, and rather erroneously in my opinion, referred to as a family, the crew of the Jupiter 2 literally is one: Expedition commander Dr. John Robinson bundled his wife and children up into a flying saucer and departed an overpopulated Earth in an attempt to colonize a planet in the Alpha Centauri system. This leads into the next point of contrast: While the Enterprise's mission is supposedly to Seek Out New Life And New Civilizations (though recall we haven't actually heard those words spoken yet), the Robinsons want basically the exact opposite: To find a habitable planet, settle down and start life anew. It should be rather obvious by now that the premise of Lost in Space is lifted pretty much wholesale from the novel The Swiss Family Robinson, just updated for the Space Age. Indeed it's not even the first work to do The Swiss Family Robinson In Space: That would be the Gold Key comic series The Space Family Robinson. The ramifications of this are interesting though; having just sort of panned “The Cage” for not being Vaka Rangi and for serving as proof positive Star Trek isn't quite what it's remembered as or thought of as being about, it's tempting to say Lost in Space is much closer to that concept and call it a show ahead of its time. Here we have a family setting out on a voyage purely for migratory and population concerns looking to find a new home for themselves. This would, on the surface at least, seem like a straightforward translation of Polynesian navigation philosophy to the Space Age. So why am I following Star Trek and not Lost in Space on this blog? Well, to be perfectly blunt Lost in Space isn't Vaka Rangi either. Not even close. Sure, Star Trek isn't, at least not yet, but the thing is Star Trek does eventually get there I argue, and the story of how it does is equally paradoxical, multi-layered and fascinating. Despite its surface level pretensions, Lost in Space never does. The reason why turns out to be rather simple: It's flagrantly, almost painfully, of its time. It's straightforwardly a bit of Cold War Space Age futurism where humans move into space as is their natural right. The fact Earth is overpopulated gets glossed over both in the pilot and in the first episode: There's no real concern expressed about the devastating effect unchecked Westernist-style population growth had on our planet or fear it will happen again; it's just the setup for the Robinsons to get into space and do cool space things. Most damning, however, is the fact the expedition is framed in explicit nationalistic terms: Powerful countries are all jockeying to be the first to populate space, and the United States wants to be the first with the Jupiter 2 mission. Dr. Smith, the cowardly villain comic relief character played by Jonathan Harris, is introduced in both the pilot and the first episode as a foreign enemy agent trying to sabotage the endeavour who inadvertently stowed aboard and the predominant story arc of the first season involves his various attempts prevent the US from achieving dominance in space. As beloved a pop culture icon as Harris made Smith, however, he's still written as overtly a villainous character: We're meant to both cheer and laugh at his bumbling attempts to submarine our rugged, competent US leads and go “oh look, the evil foreign man is so silly and afraid he even cowers behind adorable and plucky little Will Robinson”. Lost in Space is no Space Age tale of navigators and explorers, it's blatantly and unarguably a pro-colonialist fairy tale for the Cold War-era US neo-imperialist set. Despite the clunky flirtations with militarism in “The Cage” and elsewhere in the original Star Trek, even Gene Roddenberry never managed something quite at this level of jingoistic empire building. The most interesting thing from my perspective about Lost in Space and its interactions with Star Trek and Star Trek fandom actually comes about as a consequence of ratings and timeslot competition. In its latter two years, Lost in Space ran opposite the Adam West and Burt Ward Batman TV show and, like most things that ran opposite Batman, was hurriedly re-tooled into a campy monster-of-the-week adventure series and in particular played up Dr. Smith's flamboyance. This displeased many fans of the show, who had up until that point praised it for the more Hard Sci-Fi approach that defined its first season. This was fascinating for me to read, because in Star Trek fandom, at least the Star Trek fandom I grew up in, Lost in Space was *always* derided for being cheap and silly and the sort of thing we needed Star Trek to come along and deep-six when really it would seem the two shows are actually closer than some might want to admit. See, the thing about Star Trek is that it's frequently praised for being innovative in the wrong areas. What's special about Star Trek is not its utopian idealism, of which there is actually vanishingly little of as originally conceived, and nor is it being beholden to either Hard Science or Hard Sci-Fi. No, what makes Star Trek unique is its ability to blend elements from Pulp Sci-Fi, Golden Age Sci-Fi and philosophical fiction and, once it comes back next year, a gloriously camp aesthetic. It's this wholehearted embrace of camp that's one of the things that will allow Star Trek to last for over 40 years and put it into the position to transcend its origins, but I'll hold off on discussing that in too much detail until we meet the person most directly responsible for bringing camp to Trek (and you get no points for guessing who that is). Yes Star Trek technically failed and burned out after three years, and honestly as far as I'm concerned it burned out after one episode. But what's important here is that it was brought back-Not in quite the same form, it must be said, because there is still the sense that every Star Trek after “The Cage” is a reinterpretation of the original concept. Star Trek as we know it really isn't one cohesive thing, despite what the most outspoken Star Trek fans would have you believe, it's actually a diffuse group of loosely connected concepts and ideas that people have tried to nail down into a single constructed fantasy world with varying degrees of success. But Star Trek gets a second pilot, a TV series, an animated series, a film series and a subsequent reimagining on TV. Something about that idea stuck with people enough to keep digging it up decade after decade, year after year. But why does Star Trek get so lucky? Lost in Space only got three seasons too and Jonathan Harris loved to camp it up, and all that show got for its troubles was an embarrassingly abortive 90s action sci-fi film reboot starring Matt LeBlanc and Gary Oldman. 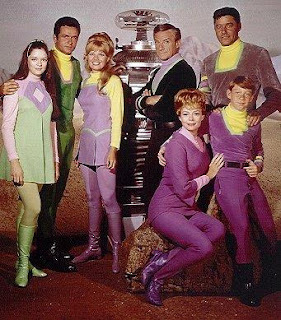 I think the answer lies once again in the fact Lost in Space was simply too much of the mid-1960s, and the hegemonic mid-1960s to boot. Despite the problematic connotations I've observed already, and some more that will crop up as the series proper begins, Star Trek is simply nowhere near as blatantly colonialist and neo-imperialist as Lost in Space is, or, if I'm honest, the majority of science fiction from this period. Somehow, some way, Star Trek was able to transcend this and survive its troubled birth with approximate success. Lost in Space couldn't do that, and it was never going to be able to: It can never be Vaka Rangi because firstly true navigators were never imperialists and secondly the Ancient Polynesians were not homesteaders of the sea motivated purely by population statistics, either. They were sailors, poets, philosophers, astronomers, musicians and spiritualists. This is the soul of a traveller. Lost in Space doesn't understand this. Star Trek does. Granted, Star Trek doesn't get it either, but the series is on its way towards figuring that out and it eventually will. Even though I admit the show in the 1960s is far from my favourite take on the concept and it's tough to tease out even throughout its best years I'm confidant it does, otherwise I wouldn't be making it the centrepiece of Vaka Rangi. Also, given the position it has in pop culture it would seem, at first glance at least, that I'm not the only one who feels this way: Star Trek is still held up to this day as the Ur example of science fiction as not just utopian futurism, but also the embodiment of pure idealism and hope themselves. Even people otherwise aware of the New Frontier Liberalist, neo-imperialist and heteronormative undertones much of the franchise has, and I'm not denying they're there, still feverishly cling to Star Trek as a beacon of light in a dark and confusing world. So why does Star Trek work? Why does Star Trek endure? The answer to that is complex and many faceted, and really the best way to find out is to take a careful look at it with renewed curiosity and a fresh perspective. So let's begin again, then. I think one of the strongest pieces of evidence that Lost in Space can't be extracted from its time is how far from its basic template the '90s film felt compelled to run. I actually quite like some of what that film tried to do (its concept not being as flawed as its execution), but had the characters been given new names its not even clear to me that people would have linked this spider-alien time-paradox yarn to its ostensible source material. It's a much easier job linking the original Star Trek to "Encounter at Farpoint". This is a really good point: Had the 1990s Lost in Space movie been its own sci-fi film and not an attempt at a reimagining, it probably would have been much more successful and much better received. In that sense it reminds me a little of the Dean Devlin and Roland Emmerich Godzilla movie, which incidentally also came out the same year. I am loving the hypothetical press conference where Devlin and Emmerich insist their new film can't be a rip-off of Godzilla because their giant mutated city-smashing bipedal lizard is, like, a hermaphrodite and stuff. If they were smarter they could've likened it to Varan or Manda instead. "See? Not *every* giant monster has to be Godzilla..."